A hiker's guide to swimming holes in Arizona and southern Utah. Secluded waterfalls, remote two-person tubs, hidden pools. It's a backcountry tip sheet for where to jump in when the surrounding rocks are sizzling and by definition the summer's coolest guide. Clothing optional spots are indicated. Similarly, icons tell dog owners if four-legged hikers are appropriate and families with small children can tell at a glance if the journey is a good one for the little dippers. Privacy is listed for each entry along with other icons indicating the best season to visit, the difficulty of approach, and the overall rating, whether fair, good, excellent or classic. Each review is accompanied by a photo and topographic map. If you buy the book you can register to download individual maps for print out at home. That way, you can fold up the map and tuck it in your shirt pocket instead of carrying a 216-page book when you're only using two pages of it. Much more elegant. In addition to telling hikers the best places to go, Day Trips with a Splash also lists places not worth visiting. After all, there are only 55 hours until Monday. Might as well make the weekend count. Desert Hiking contains the special knowledge and techniques needed to enjoy the desert. Includes information on the gear and clothing required, hiking and camping techniques, and desert survival. It introduces you to the many marvelous plants and the strange animals that creep, crawl or soar over the desert. Learn about the most important element for successful desert hiking-water, how much you should carry, and how to find it during your hike. Doin' Arizona with your Pooch! Deep in the Grand Canyon lies a place of unmatched beauty; a place where blue-green water cascades over fern-clad cliffs into travertine pools, where great blue heron skim canyon streams, and where giant cottonwoods and graceful willows thrive in the shade of majestic sandstone cliffs. Havasupai is a paradise enveloped in one of the earth's most rugged and parched landscapes. The Havasupai Tribe has never advertised its canyon and has never endorsed a guidebook to prepare visitors for a journey into the Heart of the Grand Canyon — until now. Exploring Havasupai is the essential destination guide for those visiting the area. The guidebook is filled with insider tips, fascinating background, and essential information. It identifies many new hikes, mines, springs and historical sites never before revealed in a Grand Canyon or Havasupai guidebook. Details on canyon geology, weather patterns, and the unique flora and fauna add depth to a hiker's experience. Exploring Havasupai includes detailed maps, trail descriptions, stunning full-color photographs, and intriguing historical insights. This is the must-have guide for canyon visitors, whether arriving by helicopter, on horseback, or on foot. Arizona's Superstition Mountains are like no other mountain range in the continental United States. The ancestral ground of the western Apache and sacred heights of the neighboring Pima, these mountains were once a veritable no-man's land of soaring cliffs, dead-end box canyons, and eerie hoodoos of stone, marking them as one of the last places on earth that any person would dare to tread. While this range appears on the surface to be a veritable nature lover's paradise with towering saguaro cactus forests, desert wildflowers, and roadrunners, it is also home to rattlesnakes, plants and animals that stick, sting, or bite, and modern gun-toting drygulchers. In fact, in the past century, the Superstition Mountains have claimed the lives of more than six hundred visitors, marking them as the West's deadliest wild area. Part hiking guide, part history book, and part treasure hunter's source book, Exploring the Superstitions: Trails and Tales of the Southwest's Mystery Mountains vividly brings the supernatural beauty, mystery, and majesty of this unique area to life. Within the pages of Exploring the Superstitions, readers will first be swept up in the legends of the Superstition Mountains, encountering colorful historical characters such as 1840s gold prospectors, brave hearted Apaches, and sly outlaws. Readers will encounter the native flora and fauna of the range, from poisonous rattlesnakes to rare flowers. And finally, an in-depth guide to every trail in the range will satisfy even the most experienced of hikers. Including dozens of original photos, and treasure maps, Exploring the Superstitions belongs on the shelf, or in the backpack, of every history buff, treasure hunter, and novice or veteran hiker. Felix! 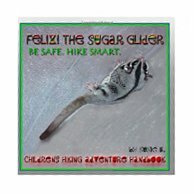 The Sugar Glider: Be Safe. Hike Smart. Hike the Forest with Felix! the Sugar Glider and his animal friends Tiger and Koala in this new interactive adventure book! Learn how to be safe, hike smart, not get lost while navigating trails in the outdoors, and find your way using a compass, map, trail markers, landmarks, and the sun and stars! Felix! and his friends show how to prepare for a hike, when and how to use safety gear, what to wear hiking, items to take in a backpack, and offer suggestions for the all-important "Snack Checklist." Felix! and his friends then take the reader along on their hiking adventure into the forest. They teach how to know if you're hiking too fast, when to take breaks, how to use trail etiquette, how to orient yourself on a trail, how to be safe around wildlife, what to do if you get lost or scared and how to get rescued. The story acquaints young readers with map reading and encourages them to develop essential compass skills before taking their next hiking adventure. A fun and interactive "Hike Smart Activities" section reinforces the story's safe hiking tips. It includes an easy guide to using a compass with and without a map, using the sun and the stars to find your way and lists important items to keep in a survival kit. This book's design reflects life in the real outdoors. Writing is intentionally subdued on the page so it does not detract from the detailed full-color photos of nature. Animals and landmarks purposely blend into their surroundings just like they do in the real world! Natural, spoken language captures the reader's imagination and makes this book fun and easy to read. Young and adult adventurers alike are sure to make this hiking adventure an essential handbook for use at home and on the trail! Five-Star Trails: Flagstaff & Sedona is a handy, concise, and inspiring guidebook that presents the very best hiking experiences in and around Sedona and Flagstaff. Each hike features an individual trail map, elevation profile, and at-a-glance information, helping readers quickly find the perfect trip. Sized to fit in a pocket, the book's detailed trail descriptions will help readers find their way on and off the trail. The title, Five-Star, does not denote a rating system, but signifies that the choice of trails and creation of hiking routes is truly outstanding and far superior to those regurgitated in ordinary guidebooks. Superior not only in quality of experience but variety of quality experiences: low desert to high peaks, staggering open vistas to claustrophobic canyons, easy to all day, lonely prairies to popular swimming holes, walking distance from the visitor center to an hour's drive from anywhere. Author Tony Padegimas introduces readers to discoveries, surprises, and imaginative ways to explore the geographic area that is, virtually, their backyard. The best Flagstaff hiking guide! First released in 1992, the authors have worked constantly to keep this guide updated and current through this new, revised 5th edition. Each hike is shown on two facing pages with complete directions to the trailhead, description of the hike, interesting historical information and a map. Each hike also has an elevation change graph, season-to-hike graph, difficulty and mileage graph and a how-crowded graph. There is a beautiful eight-page section of color photos in the middle of the book. From azurite to wulfenite, Arizona is known the world over for its rich abundance of rocks and minerals. Now in its third edition, this best-selling guide covers well-known sites, and uncovers many lesser-known areas as well. Situated in landscapes as diverse as the minerals themselves, these sites vary from arid desert to pine covered peaks. Detailed text describes where to go and what to look for at each collecting area. Maps for each site lead the rockhound to an almost limitless supply of specimens. Black and white photographs picture the collecting area. Color photographs highlight beautiful specimens found at various sites. Gem Trails of Arizona is an invaluable guide for rockhounds just starting out, or filled with expert advice and years of experience. For the experienced collector who has searched from Arizona's mineral resources for years, it is an outstanding source of the old and the new sites throughout the scenic state. James Mitchell, a contributor to the Lapidary Journal, teaches school during the year and spends summers searching the West for additional gem and mineral locations.